Rabbits spend a good deal of time grooming themselves but that doesn't mean we don't have to lend a helping hand once in awhile. Rabbits usually do not need baths but regular brushing helps keep their coat in good condition and help prevents hairballs and nail trims help keep your rabbit's feet healthy and from getting stuck in carpeting. A little grooming goes a long way. 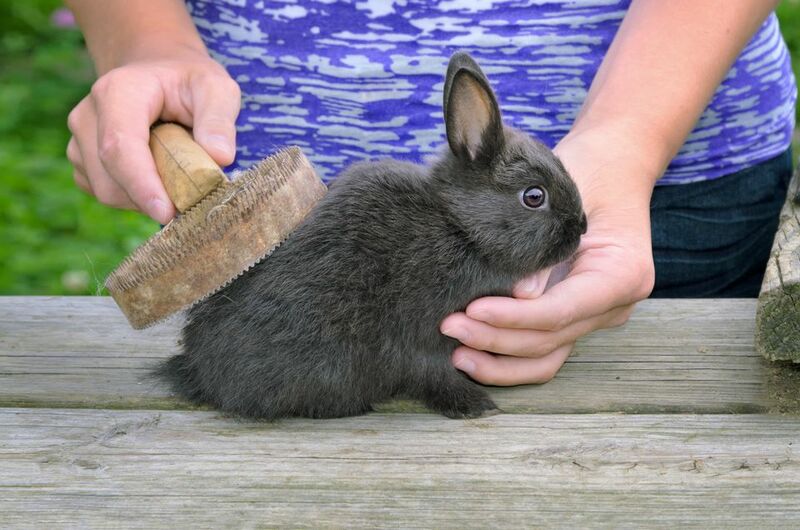 If you have a short-haired breed of rabbit, it is a good idea to brush them at least once a week. When they are shedding—they usually shed about every three months—more frequent brushing is recommended. During the heavy part of their shed, daily brushing is ideal and you will notice a huge difference in the amount of hair you brush out if you are able to do this. Keep in mind that rabbit skin is quite fragile, so be gentle and use a brush designed for rabbits if possible (bristle brushes are preferable as metal toothed slicker brushes may hurt their skin). A fine-toothed comb can also be used. Following up with a rubber grooming tool can help clean up the loose hair too, or try running a damp (not wet) washcloth over the coat after brushing to catch any remaining loose hairs. If you have an angora rabbit, grooming must be a daily ritual. Unless you are showing your long-haired rabbit, it is easiest to keep the coat trimmed to a length of about 1 inch or else the coat will be very prone to matting (but always be careful about trimming the hair over a rabbit's hocks or sores may result due to the lack of padding). Your rabbit is also very prone to developing hairballs that can cause a blockage in their stomach ("wool block") if they ingest these long hairs. You can trim your rabbit's hair yourself or get a groomer to do the first cut and then do the maintenance trims at home. You must be very careful about trimming hair though since rabbit skin is very thin and easy to accidentally cut. As with all rabbits, daily brushing should become part of the regular routine from a young age (it is also a good opportunity to bond with your rabbit). If your rabbit develops mats in their coat never try to trim them out with scissors as it is very easy to accidentally cut into the skin. Gradually work out the mat by gently separating and combing hair out of the mat a tiny bit at a time while being careful not to pull on the skin. It may take several grooming sessions to work out a mat. Alternatively, you can take your rabbit to a groomer to have the mats trimmed out with electric clippers but these can also cut the skin so care must be taken regardless of the method used. Do You Need to Bathe Your Rabbit? Rabbits do not need baths and generally find them very stressful. If a bath is absolutely necessary it is better to do a "spot cleaning" of the area that is dirty rather than subjecting a rabbit to the stress of bathing. Keep in mind when you do need to get your rabbit wet that it takes a long time for rabbit fur to dry and using a blow dryer must be done with extreme caution to speed the process. Rabbits are very prone to overheating so use a warm or cool setting on the dryer if it must be used. Regular nail trims should also be part of your rabbit's grooming routine. Check their nails once a week when brushing them and trim them whenever they get a bit long. Frequent trims are better than having to trim a large amount off even if you are only trimming off a sliver. Always have styptic powder ready and a friend to help you hold your rabbit.